Months after trains returned to puffing their way through Government Center, another iconic steaming machine has been revived. 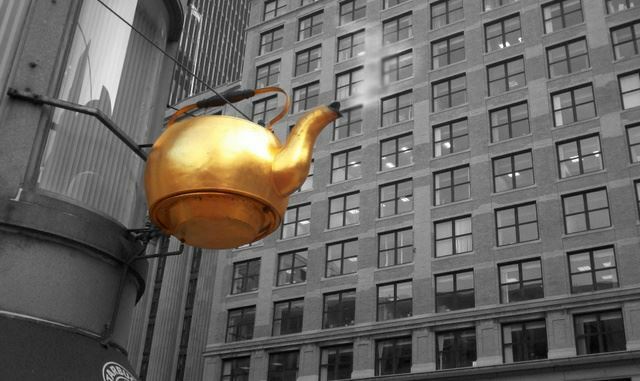 Since 1871, visitors to Scollay Square (today’s Government Center) have used the puffing copper teapot as a meeting spot and opportunity for a photo. However, it was mysteriously damaged in May of last year and has spent the months since undergoing a $15,000 restoration. The Boston Globe reports Starbucks (the kettle usually resides over the Government Center location of the coffee chain) oversaw the repairs and commissioned Northborough-based ViewPoint Sign and Awning to bring the landmark back to life. The 300-pound kettle was originally used by the Oriental Tea Company as a way to communicate what they were selling to the city’s rising population of immigrants who didn’t speak English. Fully repaired and with a new layer of gold leaf, the kettle is ready for its steaming return above the neighborhood and into many of your selfies.